There are quite of a few reasons why we wear hand wraps during MMA sessions. 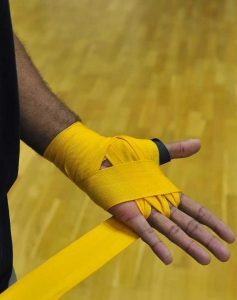 Some of them are protection for knuckles and if you have weak wrists, it does not hurt that you do one more roll with your hand wraps. There are quite a few of wrapping techniques but not all of them are suitable for MMA. And actually wrapping your knuckles more is necessary since MMA gloves don’t have much padding and protection as boxing gloves. In this really short article, you can find a video for how to wrap hands for MMA and below you can also find the instructions, what you should be careful, and my experiences. I also included my preferences as well. Without further ado, let’s start and if you are looking for a visual representation of it just check out the video below. There are a quite few ways to wrap your hands however this one is preferred more and gets better feedback from a lot of trainers in many gyms including mine in Samut Prakan, Thailand. This wrapping style has a few key points. First key point is that while rolling it across your knuckles the width of the path should be equal to the width of your knuckles. In this way, it will fit right. The wrap should cover your knuckles at least a few times. As you know, MMA gloves do not have a lot of padding and you need all the protection which you can get and you can have it with right wrapping technique. While you are wrapping your wrist make sure that you make a fist. This creates a better and natural fit and while you are training, it creates a better support. After you start wrapping your fingers, you need to wrap your wrists one more time. However, after you wrap your wrists just double check it since it may be loose and you probably won’t even notice it since you can be distracted while wrapping your another finger. This is actually one of the most crucial points. MMA gloves (at least most of them) are designed in a way that you should wrap your hands since if you don’t, while you are punching or grappling it may have some gaps and feel just awkward. After finishing wrapping your fingers and I highly suggest you do “the x” really tight. Since it stabilizes your wrist and holds all of the wrapping. After that, I generally prefer wrapping my knuckles a few more times. Since I have problems in my right wrist and this stabilizes my wrist more. Honestly, I also feel safer. Just try this method a couple of times, you may like it more. As a side note, as you may know, I have been doing grappling and many different MMA training sessions including pad work and bag work for years. I tried several different wrapping techniques including starting from the thumb which is mentioned in the video. However, in my opinion, this wrapping style is the best for MMA. If you are looking hand wraps, definitely check out these good hand wraps. I also listed some factors while choosing a style and elasticity. My last tip is to avoid complicated wrapping techniques since these do not help you grapple better nor protect your hands. Basic ones do the job just fine and these are really hard to screw it up. I hope that this short content is informative for you and if you need further information about wrapping your hands for MMA just let me know in the comment section. The video is great for learning the right technique for wrapping the hands. My son is just getting into this, and so I know that he is going to love seeing this video as he can learn from this a lot more than what his trainer was trying to tell him. We will be practicing at home. Would you say that the Meister wrap would be a good one for him to start with? So cool, I’ve been doing Muay Thai on and off for about 6 years and have always had issues with my wraps getting loose around the thumb. Can’t wait to give it a try in my next class! Yeah, that little tweak will fix that for you so you can basically perform better without worrying about your wraps. That is a long period! However, if you will be consistent I am sure that you will get way better in Muay Thai as any other martial art it requires consistent effort. What if you have a young one just getting started? Which technique would you recommend? Great site by the way. Well, it does not matter. This technique is really simple and any beginner can implement it. First, he or she may have a hard time to figure out how much he/she should roll across the knuckles and in the palm. But after that, I don’t think that there will be an issue.